I’m a huge fan of cooperative deck builders, so I was really looking forward to doing this The Big Book of Madness review. It was one of the most popular co-op games of 2015, so my expectations were pretty high. Did it live up to the hype? What is The Big Book of Madness? The Big Book of Madness is a cooperative deck building game designed by Maxime Rambourg and published by IELLO. in which players are students of magic who must work as a team to defeat monsters that are coming out of a grimoire. As the monsters are released from the book’s pages, you must use the school’s library to figure out how to deal with their curses. At the beginning of the game, each player gets to choose their student. Each of the students starts with the same four basic spells, but they will also have their own unique starting decks and a special ability. The Madness deck is your enemy in this game. Some of the monsters (and their curses) will force you to take madness cards, which clog up your deck and slow you down. These cards are tough to get rid of and can’t be discarded at the end of your turn. If you ever end up with a hand full of madness cards, you will be out of the game (because you’ve gone mad!). You begin each turn with six cards in your hand and you must figure out the best way to use them. During the action phase, you will use your element cards to deal with curses; upgrade your deck with higher-valued elements; cure madness; or learn better spells. Another option that you have during your turn is to add one of your cards to the support pool. This is a great way to work cooperatively to destroy curses or to get madness cards out of other players’ hands. 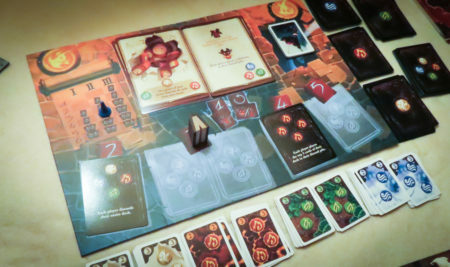 The game has six rounds, and in each round players face a different monster with a different mix of curses. You don’t have to defeat all of the monsters, but you do have to beat the last monster in the book. It is pretty much impossible to beat that sixth monster without destroying many of the other monsters’ curses, so you can’t just skip them. If the players are able to destroy all of a monster’s curses during a round, they will all get a bonus. If they leave even one curse, then they will all suffer the failure penalty. Running out of madness cards. Failing to defeat the final monster. The only way to beat the game is to destroy all of the final monster’s curses. That is a very brief overview of how to play The Big Book of Madness. If you’d like to see exactly how this game plays, check out The Big Book of Madness rule book (PDF). The Big Book of Madness is a cooperative fantasy game that does a pretty good job of bringing its subject matter to life. It’s not a heavily thematic tabletop game, but the unique monsters, the element cards and the spell cards do enough to keep you into the story. It would have been nice if they had given each of the characters a short bio, though, to add a bit more to the theme. Possibly the best thing about The Big Book of Madness is that you have to constantly adjust your strategies as the pages of the book turn. You don’t have much of a chance without good cooperation (using the support pool), which is something we like to see in co-op games. This game has amazing artwork. Artist Xavier Gueniffey Durin (Seasons, Tokaido) did a fantastic job making the board, cards and monsters come to life through his drawings. Even if you don’t end up being a huge fan of the game, you will probably love looking at it. The Big Book of Madness also has a ton of replayability. You will will very rarely face the same sets of monsters, and the upgraded spells that you can buy will usually be different, too. None of the people in our group have had any major issues with this game. It would have been great if they had given the characters their own backstories, but that’s not too big of an issue. The Big Book of Madness is one of the top cooperative deck building games out there right now. The recommended playing age is 12+, but younger kids could play it if someone goes over each part of their turns with them. It could definitely work as a heavier family tabletop game. We’re going to keep The Big Book of Madness in our gaming rotation because it’s challenging, has fantastic artwork and because it has plenty of replayability. It’s not on our list of top cooperative board games, but it’s one that everyone in our group enjoys playing. 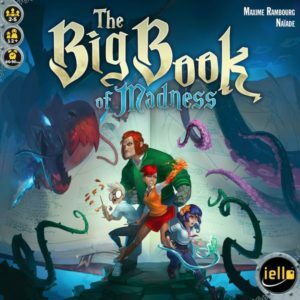 Thanks for taking the time to read our The Big Book of Madness review!